We have several large oak trees here at Our Little Acre. I love them and I hate them. They're 200+ years old and majestic. They provide most of the shade in our yard in the summer and are home to bird nests of all sorts. Squirrel nests, too. But I hate those acorns. Especially when we've had a bumper crop of them. It makes walking in the yard difficult - forget going barefoot - and they aren't that easy to rake up. Then there are the leaves. Oaks don't lose their leaves all at once. They shed them over a period of months, as in most of the year. Only in late winter are they truly devoid of leaves. You have to take the bad with the good, and in the end, love wins out over hate. 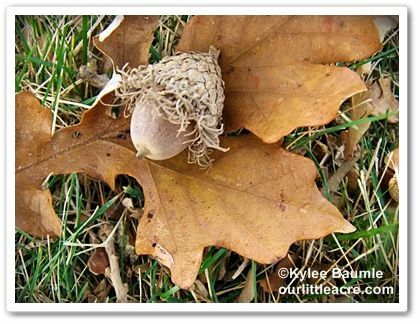 Oaks can produce acorns at age 20, but many won't produce until they're 50 years old. Acorns are edible, some more so than others. Tannins in the acorns produce a bitter taste, but some have less tannins than others (white oak) and tannins can be pretty much removed by chopping the nuts and soaking in water until the water no longer turns brown. Red oaks have high levels of tannins. 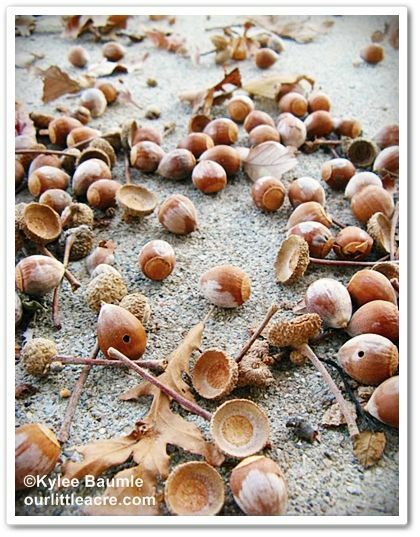 Only one in 10,000 acorns will go on to become a tree. 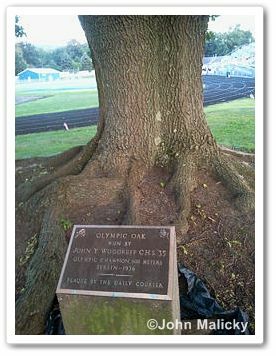 In 1936, at the Berlin Olympics, medal winners were given an oak sapling (Quercus pedunculata). As few as four of these trees may exist today. medal during the 1936 Berlin Olympics. I'm glad you are leaving them. I think the bluejays and squirrels are, too. I understand some of what you feel. We have a majestic sugar maple right where I would love to run a driveway. I think the neighbors would all come to arms if we ever dared to take it out... which we won't. Looks like at least one of your oaks is a Burr Oak, my favorite. I hear you on the inconveniences, but I would love to have one of your big old oaks. They are great wildlife trees. As to edible acorns, my wife and her brother went through a Ewell Gibbons phase, and tried to eat some roast acorns. Unfortunately, they were not the right kind, and were pretty vile. So she says, it was before my time. Barbee' ~ Oh, we would never take them down! That would be a major ordeal anyway. We've planted a few more oaks since moving here (as well as nearly 100 other trees). It takes so long to grow a tree. Good for you for keeping your maple, too! 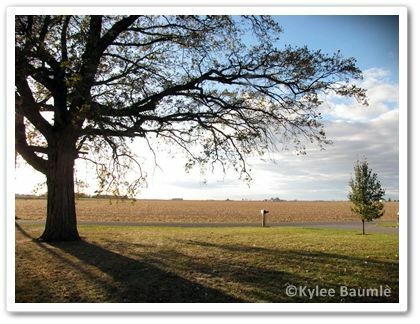 Jason ~ Yes, we have a burr oak. We've got a pin oak and a swamp white oak, too. In researching this, I was surprised that acorns were edible. I'd always been told they were poisonous to humans! Turns out they just don't taste very good. LOL. Annie ~ We do have a shredder/vac and it does a fair job sucking these up, but somehow they get embedded in the grass pretty tightly. I think it's the ones that fall from such a great distance that do that. All I know is that you don't want to be under the tree when they're falling! They hit the roof of the house and it sounds like the sky is falling!